An ivory vase of cylindrical form, supported on a short, straight foot. The top is formed by nine fluted petals that together constitute a lobed rim. The lower body is carved in high relief with an elegant archaic kui dragon, curving its elongated, tendril­-like body around the vase. The head of the dragon is well­-defined with bulging eyes, a long snout with curved upper lip and horns. The ivory has acquired a mellow patina with age. 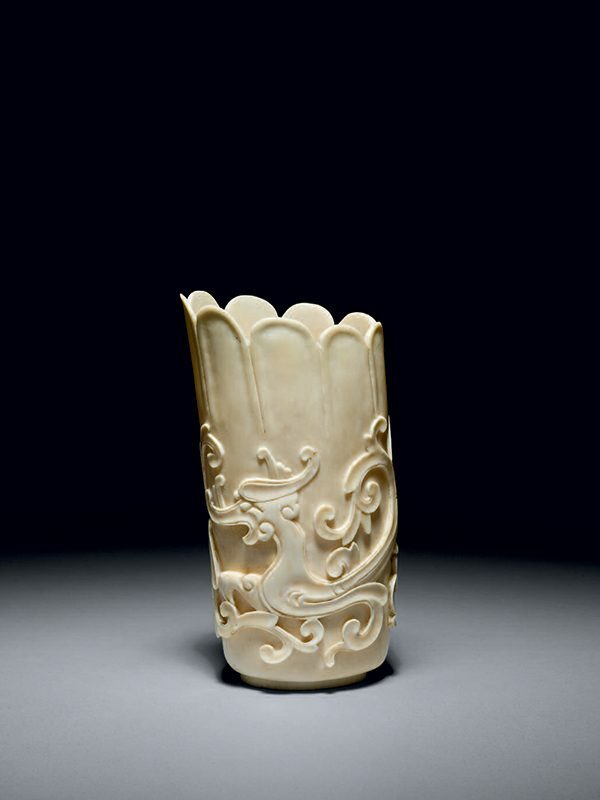 This delicate ivory vase, possibly made to be used as a brush pot on a scholar’s desk, is highly unusual, both in its design of the lobed rim and in the motif of a kui dragon. The kui dragon, characterised by its split lower part of the body and one foot instead of four feet, is a popular decorative motif on archaic bronzes during the Shang (16th century – c. 1046 BC) and Zhou (1046 -­ 221 BC) dynasties. This kui dragon, its tendril-­like body with extremely dynamic movement, not only shows the mature, skilful ivory craftsmanship of the period, but also reflects the Qing dynasty’s preference for imitating the past. A hexagonal ivory covered vase, the body carved with archaistic decoration in the style of archaic bronzes, is illustrated by Tardy. Several vases carved in relief with chi dragons were included in the 1984 exhibition at the British Museum Chinese Ivories from the Shang to the Qing.